Pad slowly through paradise and scoop up some momentary peace amid the crackle and dazzle of your day. Now, forgive me for interrupting this blissful moment of yours; but I ask you to shake the sand from the shadows of your buttocks, to step into the shade and take a cold shower. I’d like to know where paradise is. Paradise, for me, is far away from the curtsy of crashing waves, or the respectful bow of a glowing palm tree. For a start, my paradise is found in the shallows of autumn, as appose to the height of summer. I feel autumn is full of spice and fragility: a season infused with blazing survival, while all around me, people are active. They’re doing things, before the onset of those dark months. Of course, I’m generalising an autumn here in my home country, England. A few months ago while naively cascading through a tetris of Bangkok flights, I realised that I’ve travelled to many places around the world in autumn. Yet, in many ways, never been there at all. My paradise also features the gentle flow of water, because I find my paradise on misty riverbanks. Rivers are believable; plausible routes, silently guiding my wayward thoughts. A bright autumn day, silently creeping along the riverbank. That’s my paradise. Would you care to share you own? You’re free to say whatever you please 🙂 A great suggestion, I’m hoping to explore more of the Lakes this coming year. If I do, and I see you bounding over the fells… I’ll hold my hands up, “guilty as charged” and then we’ll go in search of that pub with the roaring fire. Hmmm…such a difficult question to answer and before you asked I had not even thought of it! I’m glad I kicked your brain into thinking about paradise, Siddhartha. Yours sounds truly blissful. I hope I find it one day, it sounds like somewhere I’d like to be too. Without even knowing the Meadow, I feel the allure of the landscape, Jill. Great comment, thanks for throwing your paradise into the pot. Sounds better than sitting on a cold beach with a warm beer. I may be considered strange… but paradise for me – or perhaps where I just love to be? – is in a bustling, unfamiliar city, surrounded by a language I don’t know, by people who are just going about their daily business. Standing in the middle of this craziness with a smile on my face, completely clueless. Of course, this needs to be followed by a breather on a beach somewhere, white sand, clear water. Just to get my sanity back! Not strange at all. I love cities for similar reasons to why I highlighted my love for quiet riverbanks. The anonymity of big cities is a huge drawcard, and the people-watching, well… where do I start? Go crazy in the city, recoup on the beach. A wonderful slice of paradise, Rebecca. Thanks for sharing it with me. Paradise, right now, is reading your words. They transport me to a place that exists only in my mind, a place I don’t want to leave. Great to have you back, Ant. You’ve been missed. For me, it’s comments like these that keep the ink wet. My paradise is the circle of light cast by a campfire surrounded by friends and family. Perfect. Good call, Joshy. Just me and a campfire would have been nice enough, but you topped it off by inviting all my kith and kin. Bravo. Paradise indeed. I had to think about this awhile. I’ve been to so many cool places – laid on the beach in Bora Bora, ate amazing food in Paris, grew up in the beautiful Arizona desert. But I realized my paradise is actually Peru. Yea, it is hard. I won’t take a warm shower for months. I don’t always have electricity. I get awoken in the morning by a screaming monkey. But there is no where else where the food tastes so good after a hard day at work, or where I have laughed so hard with good friends. It is not for everyone, but I have an unshakable fondness for it. Thanks Aly, it sounds like a really good paradise to me. The laughter of good friends, and great food in a great place. Paradise indeeeeed. I thought my paradise was going to be a white sandy beach lined with palm trees, but after travelling for the last two years…(tacky cliche to follow)…my paradise turns out to be sitting on a beach on a cloudy day in the south of Devon. I spent every year there as a kid, and now I’ve got a great sense of appreciation for the place. Seen many spots in NZ that would qualify as paradise for me. They all involved a house on a hill between a forest close to the beach in some quiet town. Peace and quiet in the New Zealand wilderness. I can think of worse places to live out the rest of my days. Paradise, for me, is in a cottage nestled in the mountains, surrounded by the rush of green trees and cherry blossoms, a wine glass in my hand, my dogs at my heels, and my husband at my side. But, perhaps I am just old fashioned. Glad to have you back, Ant. Keep those posts coming. Not at all old-fashioned, Akila; I can smell the sweet morning air, which swirls through the woodlands of your paradise. I think you and Tijmen (the previous commenter) would make wonderful neighbours. Paradise is the silent, hot afternoon of the tropical summer. Where we in the tropics usually slow down, take a siesta– this is the “winter” of our daily lives– and wait until the sun is less fierce so we may carry on. It is during these times that we look out and see a breeze shaking the leaves of trees, a bird landing on a tall blade of grass, or a baby stirring in a woven hammock. It is the moment of our childhood, and that of vacations– vacant, quiet, laying on each other’s laps, grooming ourselves. Once we enter the world of the white collar, “educated” work force, we no longer experience this, and when we do (whether home sick, or while travelling), it is blissful. A beautiful and heartfelt comment, Bea. Thank you for sharing your paradise with me and my readers. You painted a sublime picture of paradise; I was hypnotised by your words — so alluring, and honest. My paradise is that month I spent on the island of Ko Lipe in Thailand. Nothing has ever been more perfect. My paradise was Cinque Terre, Italy – Fabulous views, Great food, and lovely people! Can’t get any better ! But I think I have found a place that comes close to it: San Sebastian. They have warm sunny summers and great surfing, and only two hours away you can go skiing in the winter! If there’s one place I’d consider to be paradise, it will have to be El Nido, in Palawan with so many deserted islands, beaches, coves and lagoon to choose from. Hire an outrigger boat and ask your boatman to take you to Cadlao Lagoon for the day. Or to the two lagoons. Sounds like an incredibly beautiful paradise, Marco. Thanks for sharing it with me. Paradise for me would be peace of mind, and I found my perfect spot a little over a year ago. 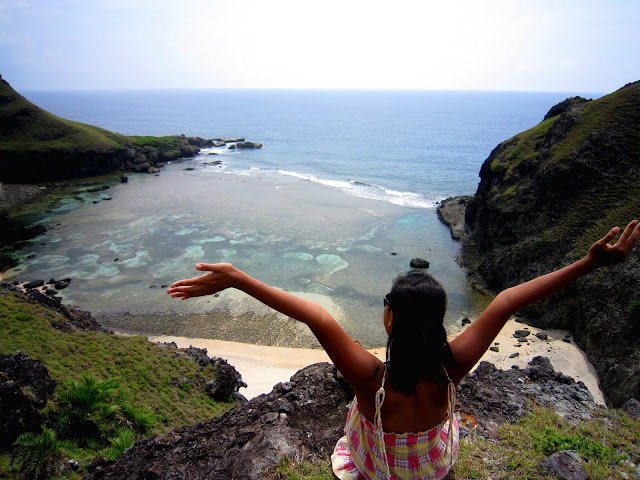 It was on a tiny island called Batanes, which is at the northernmost tip of my home country. It’s known for its harsh weather, but also for its unspoilt beauty. The rolling hills stretch on for miles, and on the edge of one meadow, there is a patch of green on a bluff that’s safe enough to sit upon. I could imagine riding my bike daily to that spot to just sit there all day, watching the waves kiss the rocky shore below, book at hand and journal in tow. The serenity of something so simple yet so inspiring seems to unknot any tension. I have a picture here (https://lh3.googleusercontent.com/-VJBXcBP3epk/TIUY5EX53II/AAAAAAAAEfw/gUdtMklMwRM/s640/IMG_0421.jpg) and a video here (http://vimeo.com/user4883788) if you’d like to see; hopefully one day you guys can witness what I’m talking about for yourself as well. Trekking after hours to see a high mountain lake and see the stunning views of South Island, now that is paradise but then I love the early mornings in Peacehaven along the clifftops, a chill in the air with a sunrise and peaceful. Hmm..
South Island as in New Zealand, missed that detail out! My paradise is watching the sun set on top of a South Korean mountain I spent the whole day hiking. You should give it a try sometime. There really is nowhere else like it in the world. That is, if you are a fan of hiking. The sky is a perfect blue, with a few perfectly white clouds to accessorize it. And the sun is at 12:00. But the most Important part of this paradise……. The road is 1 lane, it’s pavement docent look old, but docent look new ethier. And this road goes on forever, and ever, and ever. And I drive on this road, no worries, no nothing, forever…..
Sensational paradise, Mark! I was thinking it was a shame they built a highway through the middle of it, but you soon made me realise why. I hope you can find a small version of paradise sometime soon. What is my paradise? A big question indeed! How often we must all think of our little paradises, and how difficult it is to actually put it into words when asked. I think as cliche as it sounds my paradise resides on a pristine white beach, bathing in the sun and watching the gentle roll of the sea. Staring at the sea never fails to lift my spirits and remind me everything will work out just fine – what more is there to paradise than that feeling? My paradise changes. Sometimes it is a sandy beach, and other times it is a fishing trip in the fall. As long as we get away from the same old monotony it doesn’t take much to turn a day into paradise. I think my idea of paradise has changed over the years. It used to be on the beaches and in warm waters of the Carribbean. As I have got a bit older and have a family my paradise is now on the Atlantic Coast of France where we can go bodyboarding as a family. The happiest of happy days. If you are a travelling lover and interest in discovering the new lands. Don’t hesitate to plan the trip to Hue City to enjoy the landscape , the shopping mall , Hue cuisine….Hue city near LangCo beach! I think my paradise is in Hawaii. It’s such a beautiful state. If I had to narrow it down I would say in either Maui or Lanai. I have been to Bhutan couple of times. It’s a place that could have existed only in my dreams. The calmness, its medieval age lifestyle, the amazing culture, the festivals, everything in Bhutan attracted me. No, doubt Bhutan is a paradise for me. Many different locations, different experiences all put together. My paradise is at nightime in the little town of Lourdes, France. Covered by a star lit sky, mountains peaked with snow lining it, wandering warm vibrant streets with good friends. Theres something magical about walking down to the grotto at midnight and watching the thousands of people walking in unison singing with their candles lit; locals, travellers, believers, the sick, volunteers wheeling the sick, people from all over the world. You can feel the love, friendship, belief, and hope in the air. Truly a vision of the human spirit at it’s best. page as a best site for most recent updates. Tirupathi Venkateshwara temple is a famous Vedic temple in the hill town of Tirumala, near Tirupati in Chittoor district of Andhra Pradesh, India. It is the richest temple in the world in terms of donations received and wealth, and the most-visited place of worship in the world. The temple is visited by about 50,000 to 100,000 pilgrims daily, while on special occasions and festivals, like the annual Brahmotsavam, the number of pilgrims shoots up to 500,000, making it the most-visited holy place in the world. This place is devoted to Lord Vishnu, it has a compelling icon of the Lord. We at http://www.chennaitotirupati.com believe in dedication and we provide reliable services at affordable rate to each and every customer. Our tour packages will be through AC Tempo Traveller, Luxury Innova / Tavera Cars, We also provide rent a vehicle services including all luxury vehicles like, Tata Indica, Tata Indigo, Toyota Innova, Chevrolet Tavera, Toyota Etios etc. In all our packages we guide for Sheegra darshan till sheegra darshan counter for you to get assured Quick Darshan. It is about 90 km for your Ninh Binh tour from Hanoi that takes about 2 hours to drive there. You will have a chance to head to the region of Red river delta with the geographical feature of from 19050′ to 20027′ at Northern latitude and from 105032′ to 106033′ at Eastern longitude. In terms of location, the North of Ninh Binh is Ha Nam, the East is Nam Dinh and it shares the administrative border with Thanh Hoa in the West and Southwest. The remain side is near to the East Sea. I wish to express some thanks to this writer for bailing me out of such a condition. After searching throughout the internet and getting things which are not productive, I figured my life was over. Being alive without the approaches to the issues you have fixed by means of your entire guideline is a crucial case, and ones which may have negatively damaged my entire career if I had not discovered your web site. Your actual know-how and kindness in handling every item was very helpful. I am not sure what I would have done if I had not encountered such a point like this. I’m able to at this time look forward to my future. Thanks very much for the high quality and amazing help. I won’t be reluctant to propose the sites to any person who would need tips on this subject matter. Needed to draft you that little bit of remark to finally give many thanks as before for your personal beautiful views you’ve documented on this website. It has been so wonderfully generous of people like you in giving extensively precisely what numerous people would’ve made available as an ebook to earn some profit for their own end, notably considering that you could have done it if you desired. These thoughts also acted like a easy way to recognize that some people have the identical fervor just as mine to learn significantly more with regard to this issue. I am certain there are a lot more pleasant situations ahead for individuals that find out your website. My spouse and i got absolutely delighted when Emmanuel managed to finish up his inquiry from your ideas he obtained from your very own web site. It is now and again perplexing to just possibly be offering guidance that many other people have been trying to sell. And we all figure out we now have the website owner to be grateful to for this. All of the illustrations you made, the simple blog navigation, the relationships you will help to foster – it’s got mostly powerful, and it’s assisting our son and the family consider that that situation is fun, and that’s extraordinarily fundamental. Many thanks for the whole thing! I’m just writing to let you know of the awesome discovery our princess encountered using your webblog. She mastered a lot of issues, most notably how it is like to have an incredible helping mood to have the rest with ease know a variety of tricky things. You actually exceeded readers’ desires. Many thanks for offering such essential, dependable, educational and even easy guidance on the topic to Julie. Thank you for your own effort on this blog. My mom enjoys making time for research and it’s really easy to understand why. My partner and i know all regarding the compelling manner you deliver worthwhile tips and tricks by means of the web blog and in addition attract contribution from some others on that article plus our own simple princess is truly learning so much. Have fun with the remaining portion of the year. Your carrying out a very good job. Thank you a lot for providing individuals with a very wonderful opportunity to read critical reviews from here. It’s always very brilliant and as well , packed with a good time for me and my office mates to visit your blog on the least three times in 7 days to read through the new stuff you have got. Of course, I’m so always impressed concerning the awesome secrets you serve. Some 4 points in this posting are essentially the most effective we’ve ever had. I actually wanted to post a small comment so as to express gratitude to you for some of the splendid solutions you are showing at this site. My extended internet look up has finally been compensated with really good content to share with my pals. I would claim that many of us visitors are very blessed to exist in a notable site with so many wonderful individuals with valuable suggestions. I feel truly privileged to have come across your entire website and look forward to tons of more fun minutes reading here. Thanks once more for all the details. A lot of thanks for your own labor on this web site. Kim enjoys doing internet research and it is easy to see why. A number of us learn all relating to the lively way you deliver powerful steps through your blog and therefore improve response from other people on that point so our favorite child is really being taught a lot of things. Take pleasure in the remaining portion of the new year. You’re the one conducting a great job. I would like to show my appreciation to you just for bailing me out of this type of challenge. After surfing throughout the world wide web and seeing ways that were not beneficial, I figured my life was well over. Existing devoid of the solutions to the problems you’ve sorted out through the blog post is a critical case, as well as the kind which might have adversely affected my career if I hadn’t come across your blog post. Your main skills and kindness in taking care of all the pieces was useful. I’m not sure what I would have done if I hadn’t come upon such a point like this. It’s possible to now look forward to my future. Thanks for your time so much for the high quality and amazing help. I will not be reluctant to suggest your blog to any individual who ought to have counselling about this area. I’m just commenting to let you be aware of of the awesome experience my cousin’s child had reading through yuor web blog. She came to understand a wide variety of details, most notably how it is like to possess a very effective coaching mood to let others effortlessly have an understanding of chosen specialized things. You undoubtedly exceeded readers’ expectations. Thank you for delivering those precious, safe, edifying as well as cool tips on the topic to Sandra.